Now what is a wedding? Well, Webster’s dictionary describes a wedding as: the process of removing weeds from one’s garden. When we bought the house (and for years afterwards), our yard was only a couple of cars on blocks and a bathtub shrine away from Redneck Nirvana. We focused first on the interior, with necessary attention to Things That Were Blowing Up Right Now. Later, we moved on to Things That Could Cause a Freak Accident and slightly more leisurely points beyond. 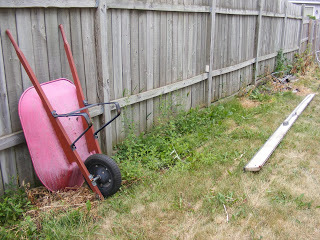 During this time, we mowed the scrubby grass, cut down the worst of the monster weeds, and planted a few gift plants. It’s all we had time for. I wish I were kidding. This was our yard. One of the gift plants was called “fleeceflower,” and it looked really pretty. It was vigorous and attractive, and I didn’t have to do a thing to it. It had pink veining on the leaves, and fluffy flowers in late summer. But pretty is as pretty does, and in this case, pretty does Dallas. It’s a very busy plant, which is a nice way of saying it’s an evil, invasive bully from hell. When it first started its conquest of our garden, I was pleased – but when it knocked out the ditch lilies and lily of the valley, I started to be concerned. When it started heaving up large rocks, I freaked. And researched. And despaired. But I knocked it back in one season, and three years later, there’s no sign of it. It wasn’t fun, and it wasn’t environmentally friendly, but over the next three posts, I’ll tell you how I did it. Commitment. With Japanese Knotweed, you have to want it. I had a mantra: “I am smarter and meaner than you, plant, and I am going to win!” Hold on to your mantra, because fleeceflower will make you feel dumb and helpless if you let it. Glyphosate (Round-Up). If this is a midway stop in your research, I can imagine your laughter. Round-Up will not kill it, no. But it’s a good start on weakening it. Spray the bastards with Round-Up to cover every leaf surface, top and bottom. You’re going to want the bigger “tank” size. Patience. WAIT. Seriously. Wait. Round-Up requires the plant to keep going while it gets down into the roots. Wait a couple of weeks. Cackle maniacally from time to time, because the plant has no idea what’s coming for it. Keep these opening moves in mind, because commitment, chemicals and patience are your arsenal in this siege. 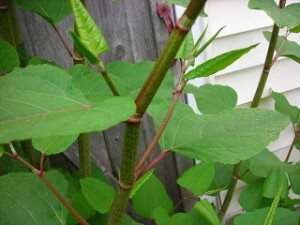 In Japanese Knotweed, Part Two, I’ll go over the next tactical stage.